Did former T&T Finance Minister break her oath over CLICO insider trading? 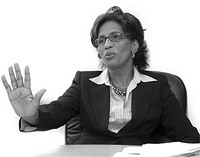 The former Trinidad and Tobago Minister of Finance, Karen Nunez-Tesheira (photo above), is once again in the news, due to her dispute with the Integrity Commission as well as her expected testimony at the next session of the Colman Commission. The former Minister has had to defend against allegations of insider trading related to her early withdrawals from CLICO Investment Bank (CIB). There was a lengthy address to the Parliament on Wednesday 4th February 2009. The March 2009 revelation in the Guardian newspaper, that Nunez-Tesheira was a CL Financial shareholder was also the cause of further defensive statements (PDF) to Parliament on 27th March 2009. In the first wave of defense, there was silence as to the fact of Nunez-Tesheira’s shareholdings in CLF. In November, her attorney attempted to challenge my position on this at the Colman Commission, but I maintained that ‘If the genuine attempt was to address the perception of corruption in a forthright fashion, all the information should have been given’. In the second wave of defense, there was no mention of the fact that the insolvent CL Financial group paid a dividend to its shareholders after writing that fateful letter to the Central Bank for financial assistance. Again, through the unfolding scandal we are witness to responsible officials who chose to be selective in making the required full and frank disclosure. All to the detriment of the tax payer.